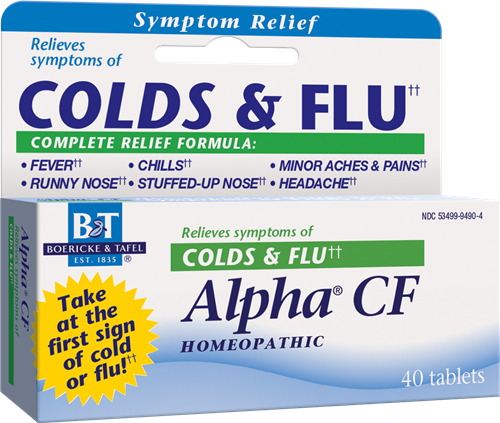 Alpha CF Tablets / 40 - Nature's Way®. Sublingual medication. Place tablets under tongue and let dissolve slowly. Best if taken at least 15 minutes before or half an hour after eating, brushing teeth or drinking anything except water. Adults and children 12 years and over: At first sign of cold or flu, take 1 tablet every hour and 2 or 3 tablets before going to sleep. As symptoms subside, take 1 tablet every 2 or 3 hours. Children 6 to 12 years of age: Take 1/2 tablet every hour and 1 or 1 1/2 tablets before going to sleep. As symptoms subside, take 1/2 tablet every 2 or 3 hours. ††There are no valid studies using current scientific methods confirming this product's efficacy. These indications are based solely on traditional homeopathic principles. Sore throat warning: severe or persistent sore throat for more than 2 days or if accompanied by high fever, headache, nausea, vomiting or rash may be serious. Consult a physician promptly. Ask a doctor before use if you have a persistent or chronic cough that lasts, is chronic such as occurs with smoking, asthma, chronic bronchitis or emphysema or is accompanied by excessive phlegm (mucus). Stop use and ask a doctor if new symptoms occur, symptoms worsen or do not get better within 7 days; fever worsens or lasts more than 3 days; cough lasts more than 7 days or occurs with rash or persistent headache. These could be signs of a serious condition. If pregnant or breast-feeding, ask a healthcare professional before use. Keep out of the reach of children. In case of overdose, seek medical help or contact a Poison Control Center immediately.